I hope all my readers in Iowa will vote for her. Joni Ernst has charged to achieve a 7-point lead over Democrat Bruce Braley in a new Iowa Poll, which buoys the GOP’s hope that an Iowa victory will be the tipping point to a Republican takeover of the U.S. Senate. 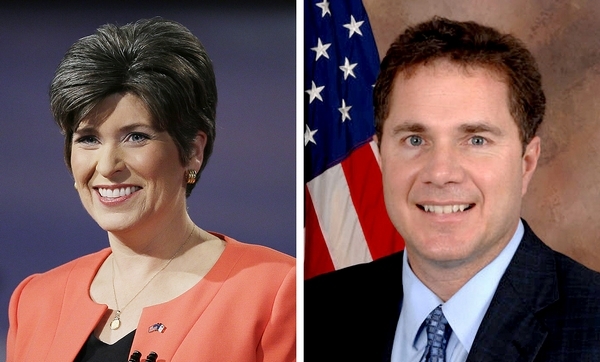 Ernst, a state senator and military leader, enjoys 51 percent support among likely voters. That’s a majority, and it’s her biggest lead in the three Iowa Polls conducted this fall. Braley, a congressman and trial lawyer, gets 44 percent, according to The Des Moines Register’s final Iowa Poll before Tuesday’s election. Although a small plurality of likely voters thinks Braley has more depth on the issues, they like Ernst better than Braley on several character descriptions. They think she better reflects Iowa values, she cares more about people like them, and she’s more of a regular, down-to-earth person. Voters find Ernst, who has led Iowa troops in war, to be a reassuring presence on security issues, the poll shows. In the wake of news developments on the Ebola outbreak in West Africa, increasing aggressiveness of Russia and the rise of the Islamic State in the Middle East, more likely voters see Ernst as better equipped than Braley to show leadership and judgment, by at least 9 points on each issue. Independent voters are going Ernst’s way, 51 percent to 39 percent. The negativity in the race has hurt Braley more than Ernst. Forty-four percent say he has been more negative in campaign ads, compared with 32 percent for Ernst. Among several potential mistakes the two candidates have made, the one that stands out is Braley’s seemingly condescending remark about Republican U.S. Sen. Chuck Grassley. In March, GOP operatives released caught-on-tape remarks Braley made at a private fundraiser in Texas that seemed to question the qualifications of “a farmer from Iowa without a law degree” to become the next chairman of the Senate Judiciary Committee. That inflicted a lingering hurt, as did emergence of the news that Braley had missed the majority of his Veterans Affairs Committee hearings, the poll shows. It’s hard for a male Democrat to push the “war on women” narrative against a woman who has been off to war. Since the article is from the ultra-leftist Des Moines Register, they register their disapproval of her support for private Social Security savings accounts. But that’s just another plus. I hope she wins, and I could see her being President one day, too. We need more REAL people, not career politicians. In Iowa, a Democrat, Bruce Braley, had a 12-point advantage among women over his Republican rival, Joni Ernst, who led by 15 percentage points among men, in a poll conducted for CNN/ORC International this week; over all, the two were statistically tied. Ms. Ernst has been a particular target of women’s groups because… she has not backed off her support for a “personhood” amendment conferring constitutional rights at conception, which would effectively outlaw abortion and some fertility treatments and birth control methods. The mid term elections are on Tuesday! Make sure you make your voice heard, especially if you are in Iowa or one of the other key senate race states.